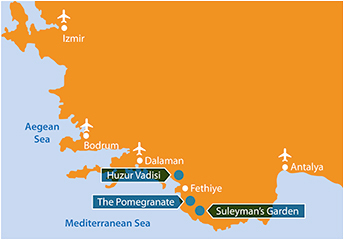 The climate in southern Turkey is typically Mediterranean. Summers are hot, sunny and dry. Spring and autumn bring warm, even hot, sunny days with the chance of occasional rain. It’s warm enough to swim and sunbathe throughout the season April to October, although you should also bring a layer of warmer clothing for evenings and early morning yoga during spring and autumn months.